Both Khabib and Conor have made weight. The fight that everyone has been waiting for since April is now only a day away and there are almost no obstacles preventing the fight from happening. Conor McGregor and Khabib Nurmagomedov will battle it out for the lightweight belt at UFC 229 tomorrow night. These two have been on a collision course for years and with Khabib winning the UFC lightweight belt (which Conor was forced to vacate) at UFC 223, it was only a matter of time before the fight was booked. Conor is an international superstar and Khabib has a massive fan base of his own. This is without a doubt the biggest fight the UFC could put on at the moment and many people are calling for it to break the 1.6 million PPV record that UFC 202 set headlined by the McGregor vs Diaz rematch. On this page I will recommend our top rated UFC betting site for Americans looking to bet on Conor vs Khabib, touch on the various bets you can make on the fight including the current “to win” odds, and provide a simple three step guide to help you quickly and easily get your bets placed on UFC 229 online. 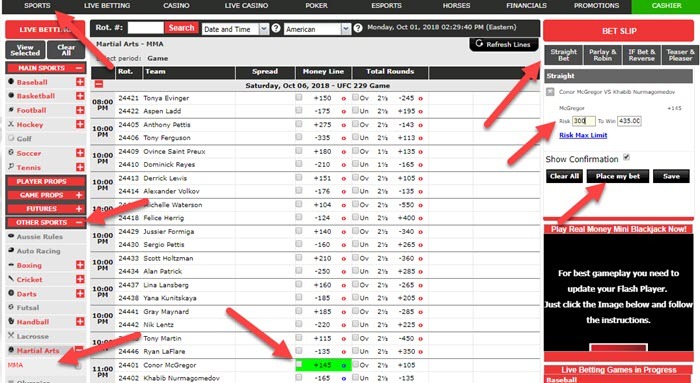 BetOnline.ag is our top rated betting site for Americans looking to bet on UFC 229. They accept players from every State in the country and BetOnline is one of the most popular and recognized sports betting brands in the United States. To see the current odds you can visit BetOnline.ag and select ‘MMA’ under ‘Other Sports’ in the “Sports” section of the website. As we get closer to the fight you will also be able to bet on various props such as total rounds, method of victory, round betting and more. Check out our how to bet on UFC page for a full breakdown of the various bets you can make. Follow this three step guide to get your bets placed on the Conor vs Khabib fight online from anywhere in the United States. Click the above link and fill out the short form on the home page to create your account. After opening your account and logging in, click on the green ‘Cashier’ button in the top right corner of the screen. Choose your preferred deposit method and follow the instructions to complete your deposit. BetOnline has a wide range of deposit options to choose from including Visa, MasterCard, bitcoin, ethereum, Skrill, and more. Use promo code BOL1000 to get a 50% matching bonus up to $1000 on your first deposit. Click on ‘Sports’ from the top navigation bar and select ‘MMA’ from the ‘Other Sports’ drop down menu. Select the bet you want to make (Conor or Khabib) and choose ‘Straight Bet’ from the Bet Slip on the right sidebar. Enter your risk amount and click ‘Place my bet’. You may need to confirm your wager as well. That’s it! You should now have a bet on the Conor vs Khabib super fight. Ready to bet? Click here to visit BetOnline.ag.